In a blog statement, Sid Shuman, Social Media Director for SIEA says that: "Our first episode will showcase upcoming PS4 and PS VR software, including new trailers, new game announcements and new gameplay footage". Typically, similar Nintendo Directs and episodes of "Inside Xbox" have featured runtimes varying from 15 minutes to over an hour, so we'll have to wait for the first installment of "State of Play" to set the tone. The Last of Us 2, Ghost of Tsushima, Dreams, Days Gone, and Death Stranding are all in the pipeline, and Sony is likely to pepper in some indies and VR exclusives as well. Of course, it is bound to have some surprises in there as well. We've already seen PlayStation and EA drop out of this year's E3, so it isn't exactly surprising that we're getting a streamed broadcast instead. At the time it was vague as to its reasons other than saying it wanted to try other avenues of communication. 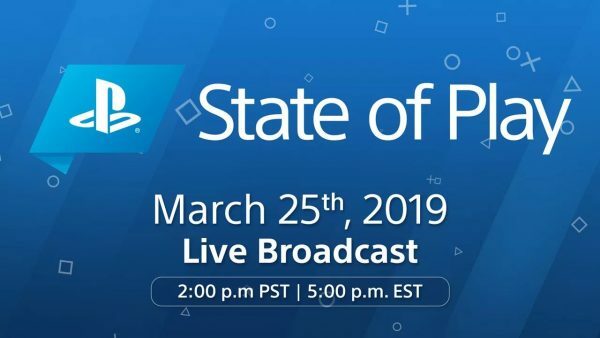 To that end, on March 25, Sony will be holding an online event called State of Play that will debut on Twitch, YouTube, Twitter and Facebook worldwide, which will act as a kind of stand in for a traditional press event. Should you miss it, Sony said a VOD edition will be made after the episode airs. Interestingly, this Monday's show will only be the first of several. "This is just the beginning!" Going forward, Sony plans on hosting these State of Play livestreams throughout the year, however a schedule was not revealed.